During its three decades, West Hollywood has become one of the most influential small cities in the nation. No other city of its size has had a greater impact on the national progressive public policy agenda. 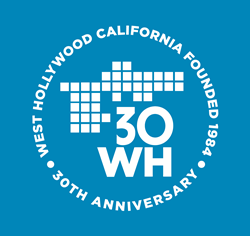 The City of West Hollywood will, on Saturday, November 29, 2014, mark 30 years as an incorporated municipality. In the year to come, the city will celebrate with events throughout 2015. In 1984, Cityhood was proposed by an unlikely coalition of gay and lesbian activists; seniors; and renters — these groups came together to form a city like no other with progressive policies and strong tenants’ rights protections. 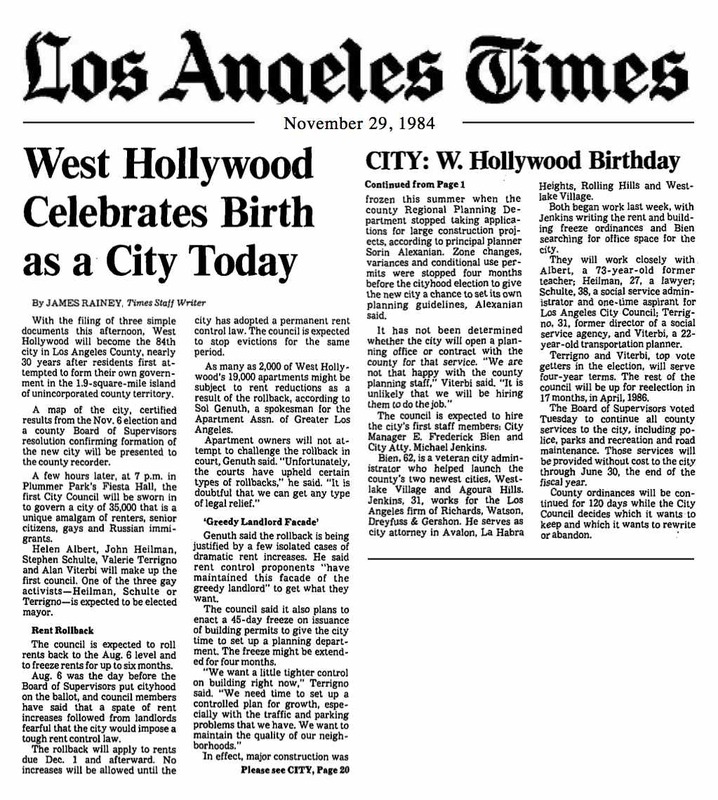 Through tireless determination, the City of West Hollywood was officially incorporated as an independent City on November 29, 1984. During its three decades, West Hollywood has become one of the most influential small cities in the nation. The ordinances adopted by the West Hollywood City Council within the first year of Cityhood included landmark legislation such as the City’s Rent Stabilization Ordinance; Ordinance prohibiting discrimination against people with HIV and AIDS; Domestic Partnership Ordinance; and Ordinance prohibiting employment discrimination based on sexual orientation. In 1985, the City Council established its Social Services program, which has provided millions of dollars in grants to fund services for seniors; people with HIV and AIDS; LGBT people; people with disabilities; alcohol and drug use recovery programs; support for Russian-speaking immigrants; services for people who are homeless; food programs; and health care services for people who are uninsured. Today, the City’s Social Services Division budgets approximately $5 million per year in critical support to local programs. The onset of the HIV/AIDS epidemic had a significant impact on West Hollywood due to the disease’s elevated infection rate among gay men which caused a disproportionately high number of deaths in the City. The City was one of the first government entities to provide social services grants to local AIDS and HIV organizations. The City sponsored one of the first AIDS awareness campaigns in the country in October 1985 and the City’s response to the AIDS crisis has been recognized globally as a model. The City has been one of the most outspoken advocates for the legal rights of LGBT people. In 1985, the City was one of the first cities in the country to adopt a Domestic Partnership Ordinance. In October 2014, West Hollywood City Hall marked its 10,000th couple as registered Domestic Partners. The City also created the nation’s first municipal Transgender Task Force in 2001; in 2009 this became the City’s Transgender Advisory Board. While blazing a trail on progressive issues, the City of West Hollywood has also received high marks for sound management policies. The City, with its diverse revenue base, recovered more quickly from the 2008 recession than most cities in the nation. During the past five years, the City’s revenues have increased and have now surpassed pre-recession revenue levels by 12 percent. The City has invested in a series of Capital Projects including the West Hollywood Park Master Plan and, in 2011, the new LEED-rated West Hollywood Library. In 2013, the City conducted a Community Study — one of the most intensive community engagement projects in the City’s history. The study updated the City’s demographic data and provides information to inform funding priorities for social services initiatives. In the study, 90 percent of respondents rated their quality of life as excellent or good.